Less waste, more paint! That's a mantra we can live by, but it's also our intention behind our latest Happily Ever Home DIY tutorial. There's no need to toss perfectly good door knobs when spray paint is around, especially if you have a limited budget. Oh, builder basic hardware, we all know it too well. That bright, shiny brass gold is not many couples' favorite when moving into a new home. This dated look eventually shows their age with rust, tarnish spots, and scratches since their purpose is "just to cheaply complete the project" instead of for the long haul. 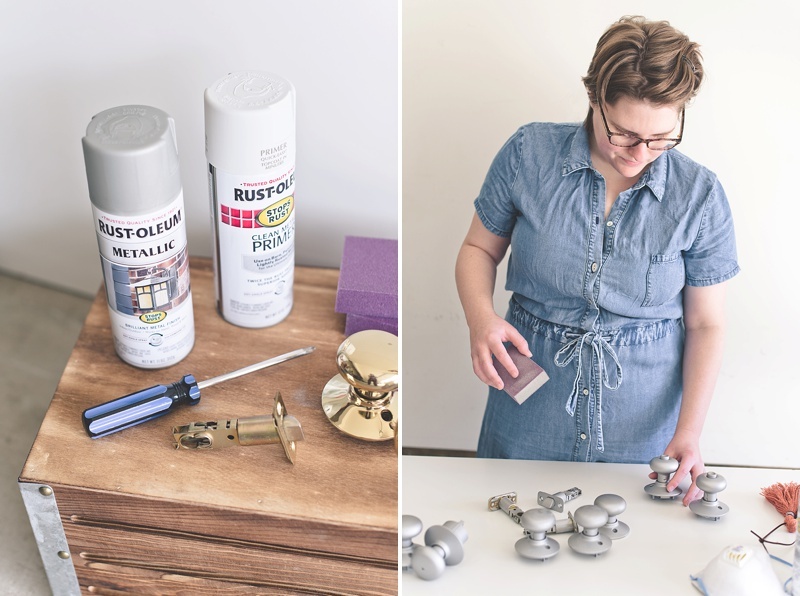 So using some Rust-Oleum spray paint, elbow grease, and bit of time, we hope we inspire you to upgrade those door knobs from basic to way better! HOW MUCH SPRAY PAINT DO I NEED? In our house, we have 21 door knobs with coordinating hardware and hinges, so I ended up using 2 cans of matte nickel spray paint, 2 cans of white primer, and 1 can of clear gloss enamel. Each door knob got about 2-3 coats of primer, nickel spray paint, and gloss enamel. WHAT SHOULD I KNOW ABOUT SPRAY PAINT? 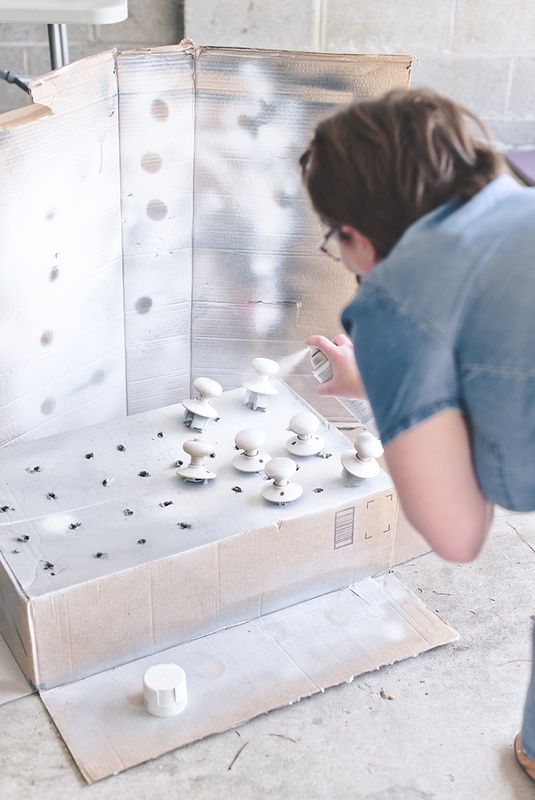 If you're new to spray painting, your DIY world is about to change! First, always read the directions on the spray paint can for optimal results. You need to spray paint in a well-ventilated area, preferably outdoors or in a garage. If you have any respiratory issues like asthma, be sure to always wear a protective mask for chemicals while spraying because it can trigger chest tightness and breathing issues. While spray painting, try not to get too close to what you're painting as this can create drippy patches. Long strokes of light coats of layered spray paint is a great rule to follow. For us Virginians, humidity and temperature can play a negative part in your spray painting experience. A common best practice is to only spray paint when the humidity is between 40%-50% and the temperature is between 50°F and 90°F... which means summertime can be the pits for projects. Plan accordingly! 1. Unscrew and detach door knob units from all of your doors. A typical door knob comes in 4 parts: front knob, back knob, latch, and strike plate. For someone who might feel intimidated by never having done this before, have no fear! 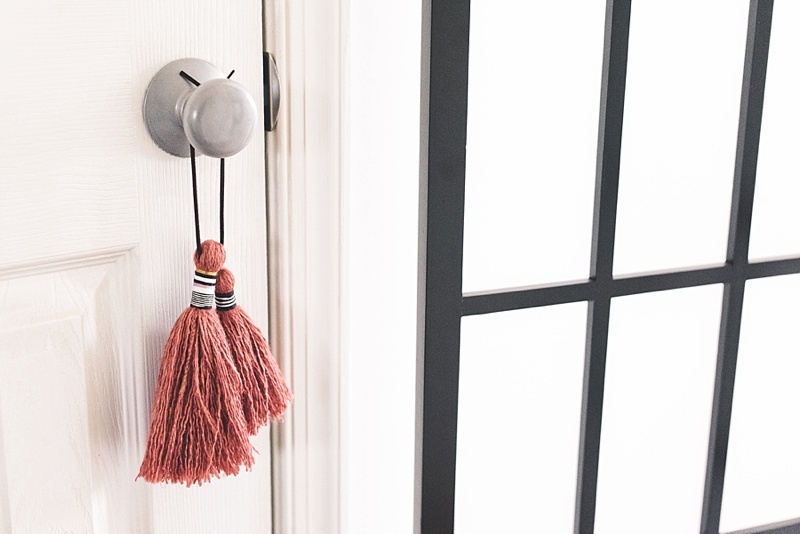 Door knobs are super easy to uninstall and reinstall; they're like simple puzzle pieces that connect to each other. You can't mess it up! STRIKE PLATE ADVICE: After a bunch of research, I decided to not spray paint our strike plates. Because the strike plates get the most friction, these parts have the potential to wear down quickly, so after all the work of transforming them, they might not have the long-term quality I was wanting. Strike plates are so inexpensive (e.g., 2 for $2 from Home Depot) that it was worth it to me to not have to go through all the DIY steps with them. Most builder basic strike plates are the same size, but bring in your old plate to your local hardware store to find the perfect fit. 2. Organize your door knob parts. Place the knobs in one box, the latches in another, and the tiny screws in another. This will help keep things together as you prep the various steps in this project! 3. 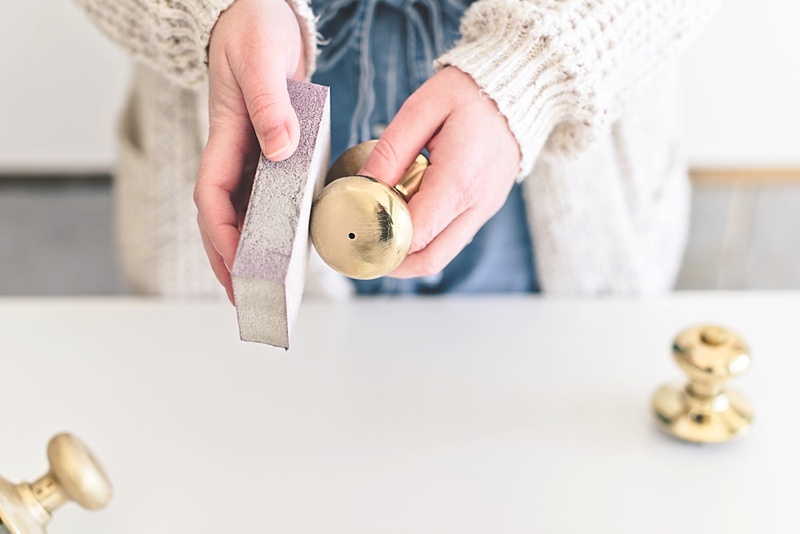 Using your sanding sponge block, sand your door knobs and latches so that they are no longer shiny. This helps the primer and paint "cling" better for long-term use. HELPFUL TIP: Don't skip this step! 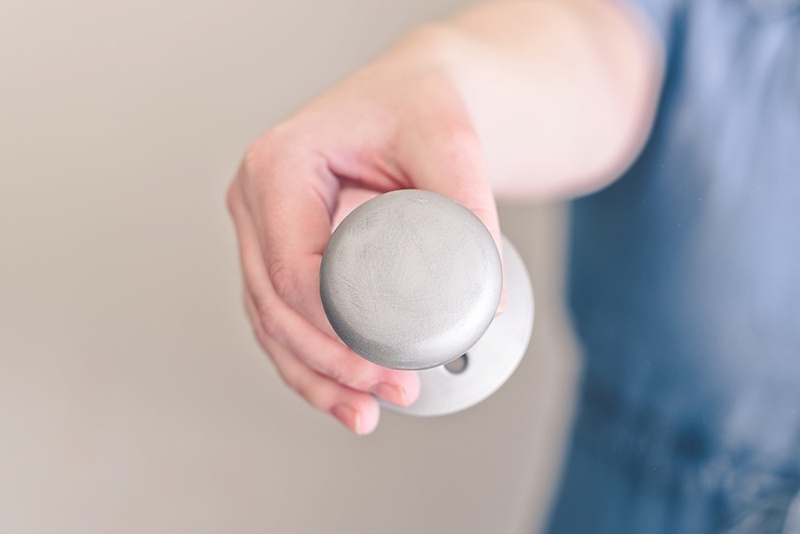 Some tutorials might advise that sanding isn't necessary, but this is a Spray Paint 101 must do, especially because all kinds of hands are continually going to be touching and moving these door knobs. If you're putting the time investment into this, you don't want to have to redo your knobs next month or year! Sanding also helps get rid of dirt and grime that might be lingering on your knobs. 4. 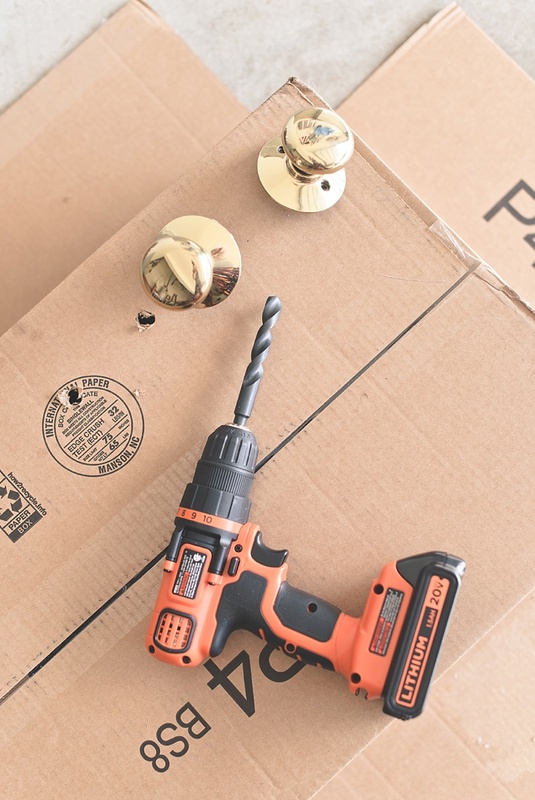 Take out your cardboard boxes and create holes to help your door knobs and latches stand up. You can use an electric drill, screwdriver, or whatever tool to puncture the cardboard. 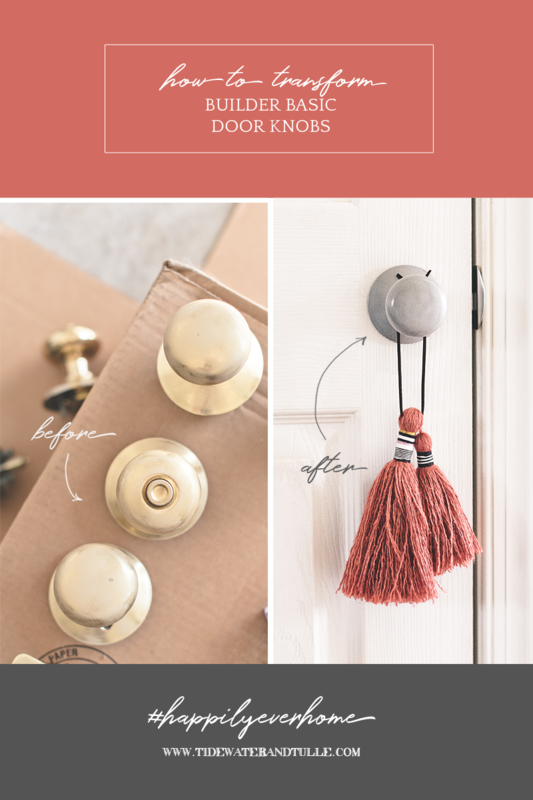 The more door knobs you have, the more upcycled boxes you might need to help you spray paint. HELPFUL TIP: If you have a local Aldi grocery store near you, they always have free boxes! Their yogurt boxes with circle slots are perfect for drying and curing your door knobs. We eat a lot of yogurt, so it was a fun find to know that their flat red boxes were ideal for this project. 5. Time to Prime! No 2-day shipping necessary for this one. 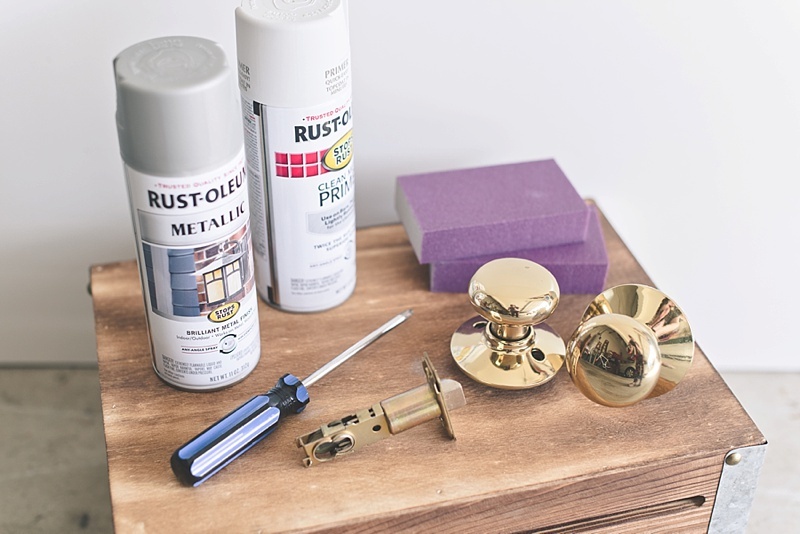 You need to prep your door knobs with your Clean Metal Primer for a great spray paint foundation. When wet, the primer will look glossy. When dry, it gives a matte powdered look. Allow to dry completely before applying additional coats. 6. Once completely dry, turn your door knobs upside down so you can prime the underside of the knobs. The brass color should be completely white by the end of this step. Allow to cure for 24 hours before going silver. 7. While your knobs and latches are drying from their primer treatment, don't forget the screws! 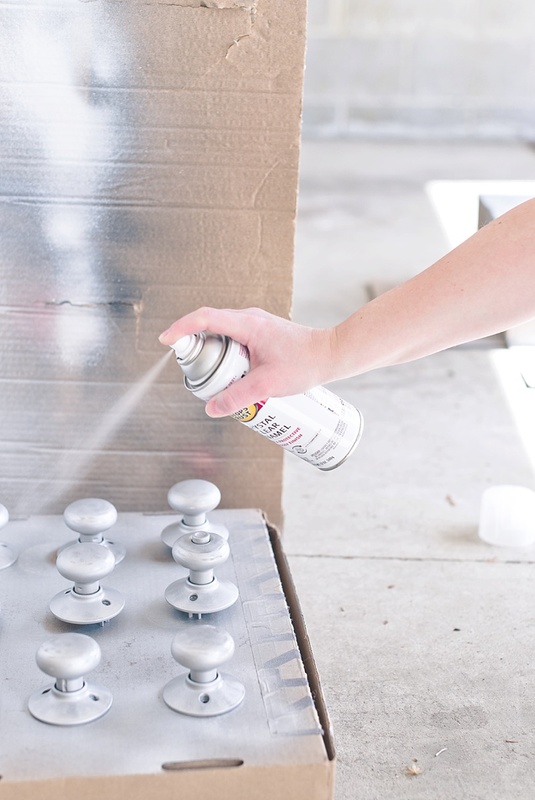 To help with your spray painting, poke the screws into a piece of upcycled styrofoam so that they are upright. 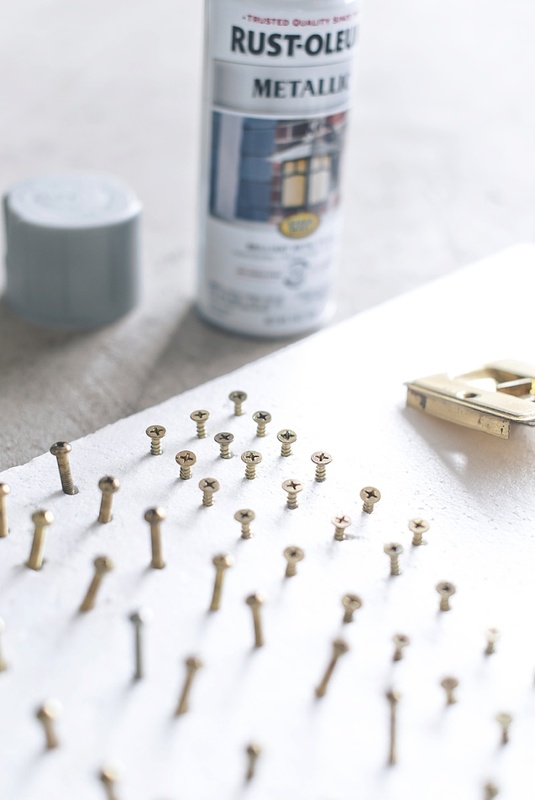 Take your Matte Nickel spray paint and give a light coat to the tops of the screws. Allow to dry and apply a second coat. Let the screws dry for 48 hours before any kind of installation. HELPFUL TIP: Because the screws don't get a lot of human touch, a primer coat isn't necessarily needed. Save yourself a step! As long as you let the spray paint cure for 48 hours, it's tough as nails (errr screws)! 8. After the knobs and latches' primer has dried for at least 24 hours, it's time to spray paint with your Matte Nickel! Spray in light layers, allowing each coat to dry before adding another one. 9. Once dry, turn the knobs upside down so you can spray paint the underside of the knobs. The white color should be completely silver by the end of this step. Allow to cure for 24 hours before scuffing the paint to add texture and depth. 11. Scuff each door knob very lightly in various directions to create small scratches on the surface. You should not see the white primer beneath or you might be scuffing too hard. HELPFUL TIP: If you have scuffed too hard, no worries! Just lightly spray paint the door knob again and allow to dry. With the amount of door knobs you have, it is likely that there will be a few that need a touch up or two. If this step is needed, be sure to wait another 24 hours before scuffing again. 12. 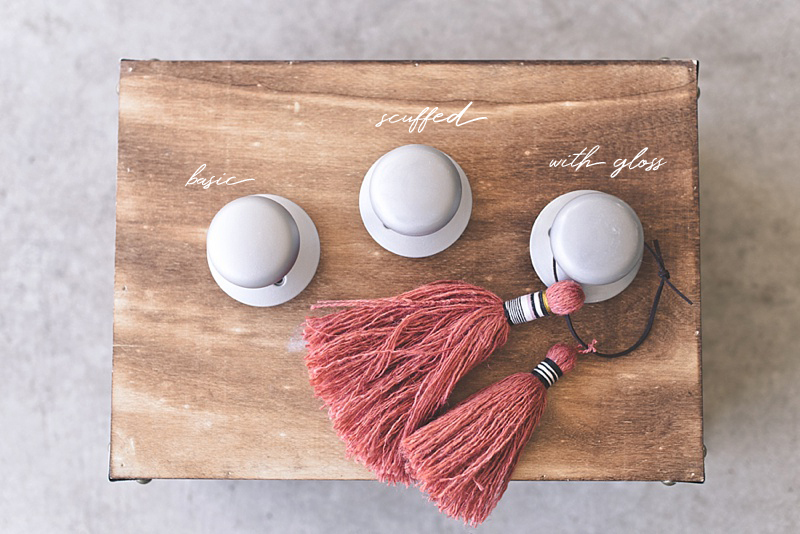 Set your knobs on your cardboard surface to give it the glossy treatment with your Crystal Clear Enamel. Lightly spray from multiple directions to make sure your knobs are completely covered with the gloss enamel. This spray dries quickly, so apply another coat after a few minutes. Allow to set for a couple of hours before reinstalling your door knobs. 13. Reinstall your door knobs and latches with your painted screws. 14. That's almost it! While we have finished with this particular tutorial, don't forget to also spray paint your door hinges to match your door knob parts. 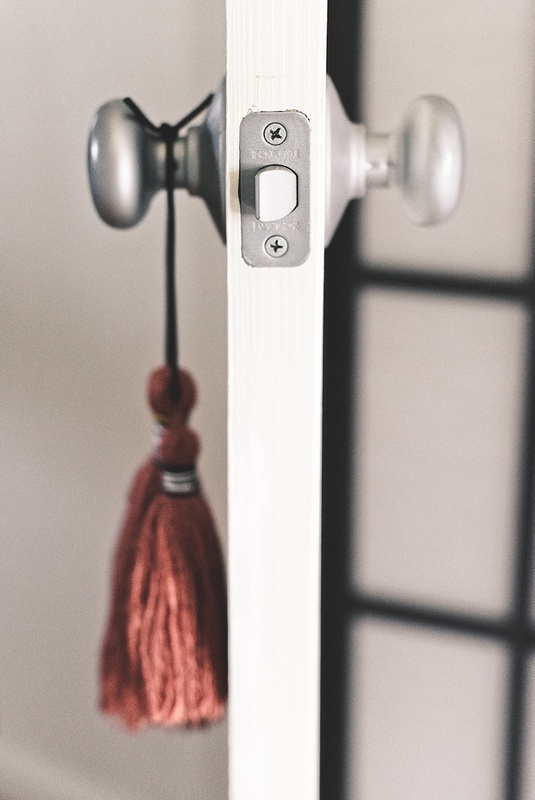 Go through the same steps as you did with your screws (primer optional), and then you've got some pretty upgraded door hardware and a new look in your home! The time investment is well worth all the money you have saved, and you have created less waste by upcycling your builder basics. 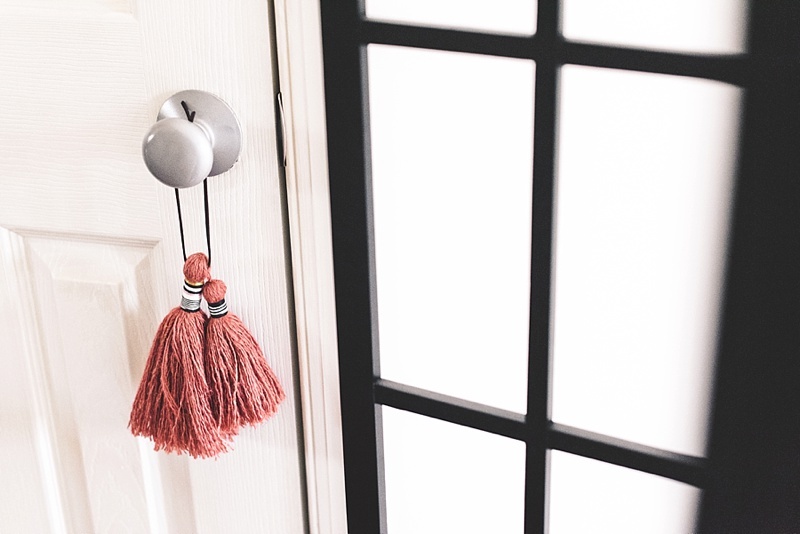 Beyond upcycling your door knobs, you can refresh your interior with a few styling ideas to make your house, your home. • Find some tassels. 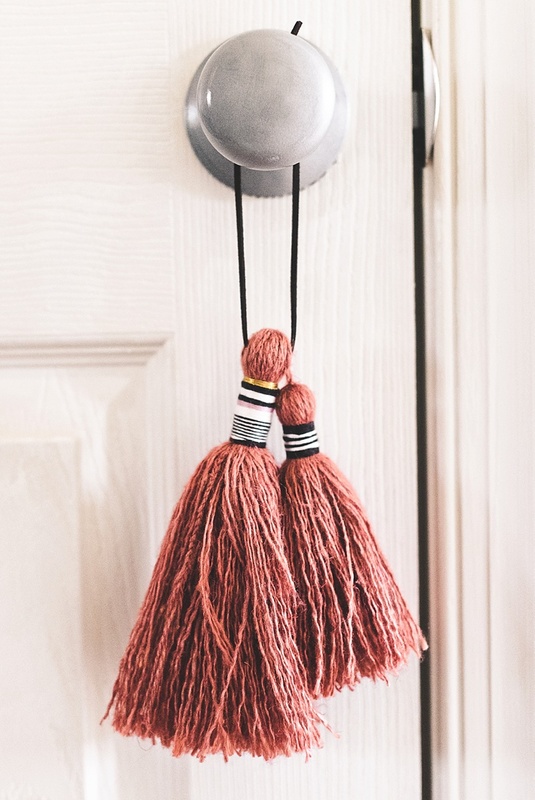 We fell in love with this terracotta-colored tassel duo from the Pixi Hill shop on Etsy. 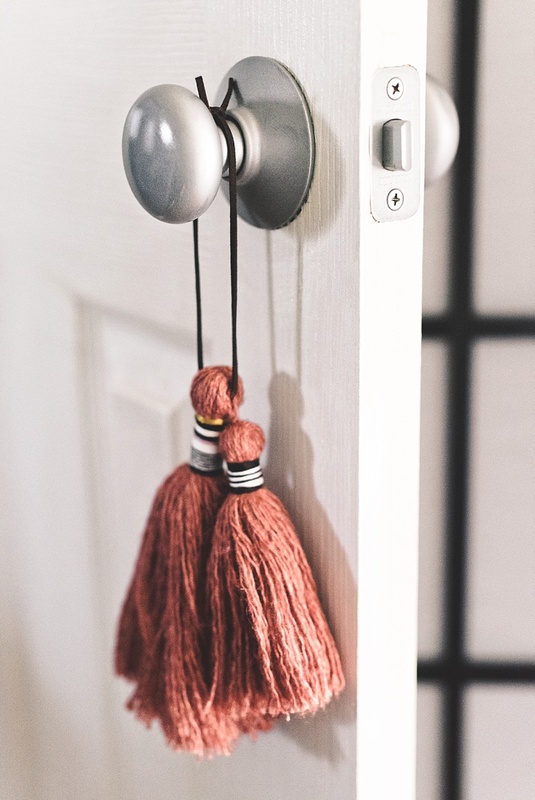 They come in so many colors and textures that can help bring color to your doors or even communicate to guests where to find something via your tassel. • Touch up your wall paint and door trim. Over time, the walls are likely to lose a bit of its shine and acquire some dings, so touch up your walls with Patch and Prime and some paint. • Hang a sign or wreath. 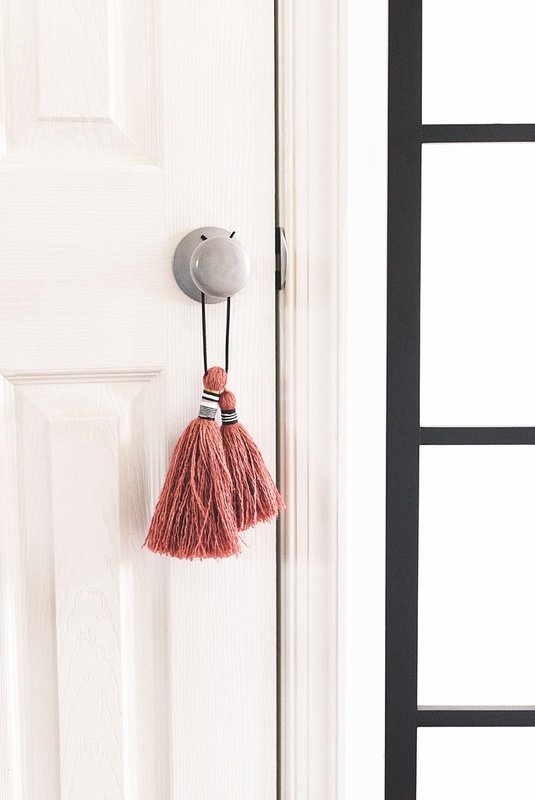 Depending on the season or preference, decorate that door with something that fits your style! Try to avoid nails by using hooks with command strips that don't damage the door's exterior.